Aristophanes’s The Birds, 414 BC, in a production directed by Nikos Karanthanos, 2016. Rehearsal view, Onassis Cultural Centre, Athens, September 16, 2016. Photo: Stavros Habakis. 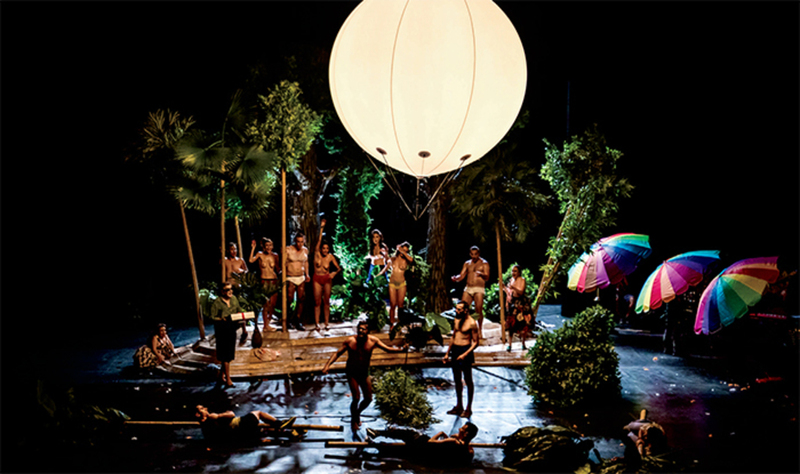 1 THE BIRDS (ONASSIS CULTURAL CENTRE, ATHENS, SEPTEMBER 17–23; DIRECTED BY NIKOS KARATHANOS) Aristophanes’s simple story about man’s desire to fly, to migrate to new worlds, is enduringly witty and perverse. Karathanos’s production gave poetic urgency to the play’s theme of fluidity among the categories of man, animal, and god, embracing our inherent need to dream and offering hope for decadence.